There’s that thing, that topic that gnaws away in an alleyway of your mind. Perhaps it’s the last acrimonious discussion you had with a lover or the overdraft on your bank account, or maybe it’s a work project that didn’t unfold as planned or your child’s school report. “In an alleyway of thought” considers such matters that the clinging mind chews over. This poem is included in the collection of Emily’s Poems for Modern Boys, which was part of a year-long project during which I wrote over 129 poems. In the Ocean was the second book to develop from the endeavour. 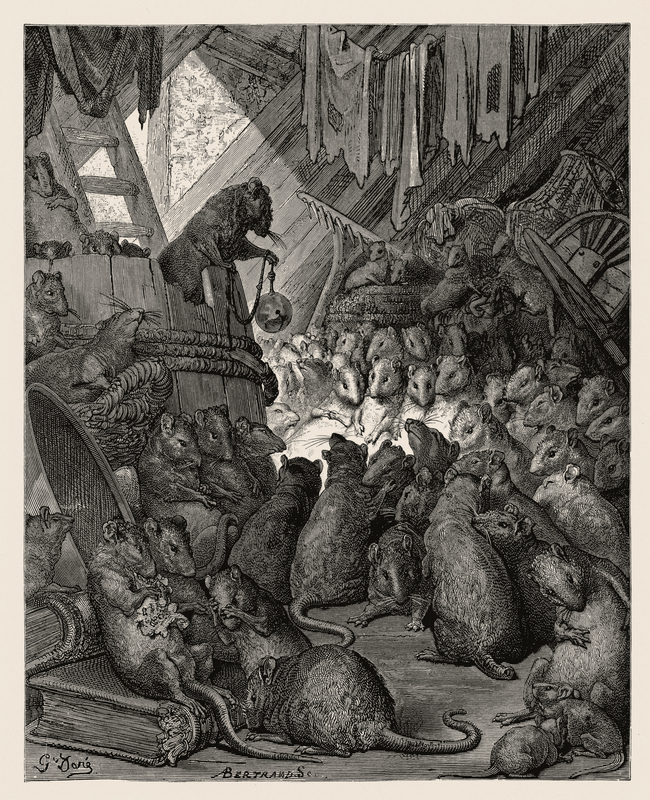 IMAGE: “The council of the rats” by Gustave Doré – http://www.flickr.com/photos/49580580@N02/5340390820/. Licensed under Public domain via Wikimedia Commons. snouts for a morsel to inch through. and nibbler of all that should be left to decompose. For another poem that develops a metaphor from kitchen leftovers, see the recent “Tightly Sealed.” The above poem and others produced over the last year are earmarked for two forthcoming volumes. Emily’s Poems for Modern Boys explores a young woman’s response to the men – older, younger and boyish – in her orbit. Under a Blue Dome is an unfolding miscellany of poems about ordinary life under the great, grand sky. If you haven’t yet seen my first volume, SHINING IN BRIGHTNESS, you’re invited to preview it at blurb.co.uk. Follow my Twitter musings about monkey, rat and martial mind. I tweet as @BeadedQuill. BeadedQuill is also on Facebook. Do “Like” the page.